Why do feet hurt in thongs? Why do feet hurt in thongs ? Thongs: If you are reading this, you are probably wondering why your feet hurt in thongs ? Let us tell you why and give you the best alternative options. If you are unsure of what thongs are, they are a sandal-like shoe with a thin rubber sole and a V-shaped strap that goes from in between the toes to either side of the foot. Also known by other names like flip-flops, pluggers, slippers and jandals. We definitely don’t mean the skimpy undergarments that Americans refer to by the same name. The main issue with thongs is that they provide little support and stability for your feet. You may be thinking that a lot of people walk around in thongs…. so why aren’t they all in pain? 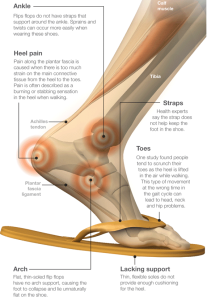 For pain to occur a number of factors need to contribute and wearing poor footwear is just one component. Others include: having poor foot structure like fallen arches, standing on unforgiving surfaces, increasing age, increased body weight and longer time spent standing on your feet. Modern life has changed the environment that our bodies interact with, making shortness in the muscles of the back of the legs very common. When the calf muscles are tight, having your foot absolutely flat to the floor creates a lot of rotation in the foot and leg. The Achilles Tendon becomes taut before the heel is ready to lift off to start the next step. It also requires a lot more muscular energy to lift the body that first centimetre off the ground. Hamstring tightness is also amplified by being flat footed. We would say that the flatness is the single biggest drawback to common thongs. A little elevation at the heel – ideally 8mm or so – can greatly increase comfort and reduce fatigue if you are one of the 50% of the population whose feet aren’t mechanically great. The same goes with flat, fashion sneaker styles and shoes like ballet flats. Sport shoes that offer a ‘barefoot’ experience can be hard work for your feet, legs and body unless your mechanics are just right. You don’t have to be exercising to be putting high amounts of force through your feet. It maybe that you stand up at work all day or like to hit the shops in your thongs. Very flat, unsupportive shoes contribute to the muscles, tendons and ligaments in the foot overworking and becoming strained. At our clinic, we commonly see patients who regularly wear thongs or other very flat shoes presenting with pain in their heels, arches, ball of the foot, shins and knees. Specifically, you may have heard of plantar fasciitis and Achilles’ tendinopathy. We have noticed over the years that problems we used to see in people in their 40s and 50s are now happening to those in their 20s and 30s. Sometimes it is brought on by a new job with higher demands placed on the feet, or a simple thing like moving from wooden or carpeted floors to harder areas such as tiles or concrete. Whilst internal heel pain is common amongst people who wear thongs, another problem you might get is dry, cracked heels. Constant exposure to the air causes skin to dry out and crack. Also nothing is stopping the fat pad under your heel from expanding sideways. This can contribute to why your feet hurt in thongs. When walking, toes may have to claw if they are working harder to keep looser thongs on your feet. This initially can cause pain as the muscles are overworking but overtime can lead to permanent toe deformities like clawed-toes. At the end of the day knowing all the ‘bad stuff’ about why feet hurt in thongs may not stop you from wearing them. Especially given Brisbane’s warm climate. Therefore, we recommend choosing a supportive, orthotic style thong. It should have a sturdy sole of adequate thickness to protect the bottoms of your feet and help absorb shock. A supportive thong should also only bend at the spot where your foot bends naturally. It should not fold completely in half. It is also important to have built in arch support and soft straps to reduce the likelihood of blisters occurring. Don’t forget that the rear part of the thong (or any other shoe) should be around 8 mm thicker than the front. This is especially true if your feet are not perfect or if you tend to get tight calf muscles, Achilles’ Tendon or hamstring muscles. All of these characteristics are part of the stylish Orthaheel thongs and Vionic footwear we stock in our podiatry clinics. We have a range of colours available for men and women so come in and check them out. If you already have pain, you are better off having a professional podiatrist assess you early. Letting pain become a chronic problem can make it more difficult to treat in the long term.